Creating the event of your dreams is like putting together a complex jigsaw puzzle. You start off with the perfect image in your head and then spend hours piecing together each part until you arrive at your final destination. Alongside finding the perfect marquee shape and design to suit your guests, there is a multitude of other considerations needed to ensure your guests are comfortable at all times. Portable toilets are just one of these. The beauty of hosting a marquee event is the freedom to place your guests anywhere, without the restrictions of brick and mortar. The downside here is the loss of basic facilities, such as toilets. However, the marquee industry has learnt how best to deal with this by bringing some of the most luxurious and well-kept portable toilets to their customers. But, as someone who may have had minimal experience with hiring port-a-loos in the past, how do you know what questions to ask? The Carron Marquee Portable Toilet guide is here to help. Which events require portable toilets? Consider the different things that could put a hurdle between you and the perfect event? If the lights all went out, there would be no dancing or socialising into the night. If the caterers didn’t show up, guests would be left clutching their stomachs as hunger rumbles echoed through the marquee. And, similarly, without portable toilets, your guests would be left in an uncomfortable and embarrassing situation relatively quickly. Even if you’re fortunate enough to have a physical building close by with toilets that are readily available, the sheer quantity of guests could result in unfortunately long queues at busier times of the evening. 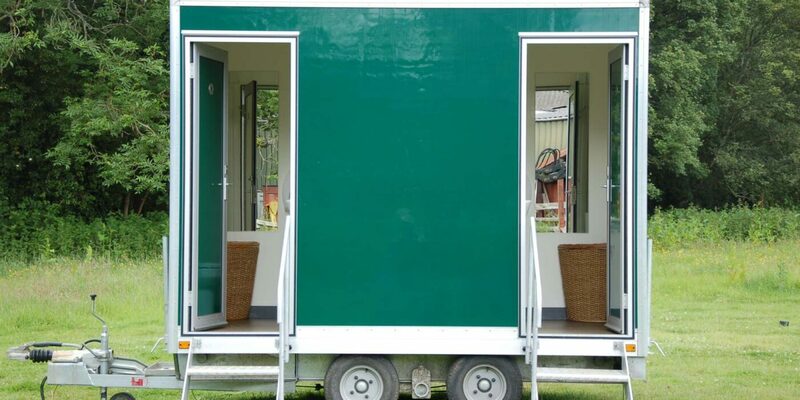 Portable toilets are the perfect solution to this and can be dotted around your event to ensure no guest is more than a short walk away from one. Portable toilets are made up of four different components; the toilet seat, the holding tank, the flushing mechanism and the pressure system. They work in a similar way to conventional toilets other than the waste is transported to a holding tank, rather than directly to the sewer. Within the holding tank, a special blend of chemicals is included to help break down waste, kill germs, destroy smells and reduce toilet paper. During the flushing process, water is either derived from an integrated water tank or the toilet chemicals from the holding tank. The Carron Marquee Portable Toilets all feature a hand operated flush system which creates pressure within the toilet. This circulates the water or chemicals through a pipe and then to the toilet pan. To maintain the smooth runnings of our toilets, the pipes, flushing system and holding tank are regularly serviced. This minimises the risk of blockages and ensures that, when they’re sitting in your event, our luxury loos run smoothly the entire time. When it comes to event planning, the chances are it’s a one-off thing. Unless you run a large entertainment company, marquee hire is usually undertaken by premarital couples, corporate HR teams or other single-use parties. However, if you find yourself in need of portable toilets on a regular basis, there may be cause to research whether hiring or buying is the right option for you. You will need to have a large and secure location to store all the toilets when out of use. You will need to obtain a Waste Carriers License which is an additional cost on top of your event. You will need to ensure that trained and professional individuals install your portable toilets properly each time. On the contrary, by renting a portable toilet, you eliminate any degree of stress. Here at Carron Marquees, we will help you to find the perfect luxury loo for your event before having it delivered, installed and maintained throughout the entire duration. We take care of all licensing in relation to waste and ensure that your facilities are fully legal before we let you enjoy the fruits of your labour. Hiring a portable toilet is also a considerably cheaper option, especially for one-off events. We will help to ensure your hiring options fall within the remit of a specified budget and stick to this throughout all aspects of planning. When it comes to planning large and extremely important events, such as your wedding day, we take the stress and worry entirely on our own backs. You should be focusing on finding the perfect floral displays for your tables, rather than worrying about basic facilities such as toilets. How many toilets will I need for my event? This is one of the most common questions we get asked during event planning and there’s no surprise as to why. Identifying just how many toilets you will need for different event settings can be confusing but luckily, there are a number of accepted rules you can go by. 1 x portable toilet per 85 guests. 1 x portable toilet per 100 guests. Remember that alcohol and food both have a significant impact on how many toilets are required. As a general rule of thumb, add-on between 15 – 25% more toilets according to how thirsty you expect your guests to be. For example, if you’re hosting a corporate event in the middle of Summer, guests are likely to consume higher quantities of alcohol than if you’re running a short, intimate poetry reading. Another thing to consider when choosing the right number of toilets is the space of your site. You want to ensure that there is a toilet placed within walking distance of every densely populated area. Especially for events with both alcohol and food, choosing the right placement ensures that guests aren’t left clutching their legs together as they hobble halfway across the field to find the nearest restroom. As you can see above, the duration of your event will also directly impact the number of portable toilets you require. Make sure you understand how regularly if at all, your toilet’s internal bins will be emptied throughout the day. For most single day events, a pick up at the end of the celebration is adequate. However, for longer events, you need to ensure a waste pickup is organised or you have surplus toilets in place to deal with all of your guests. Are events toilets used in other environments? Our portable toilets are strictly reserved for event purposes. They are maintained to a high standard throughout the year, whether in use or not. In restricting the installation locations of our toilets, we are able to keep our toilets in the best condition and ensure they blend seamlessly with your event. To stay in keeping with your own elegant theme, luxury loos are designed to fit in perfectly with their environment. Forget the mottled grey boxes you’ve spotted on numerous construction sites – in the modern world, toilets needn’t be the eyesore of any event. Here at Carron Marquees, we have custom-manufactured luxury portable toilets that you won’t be ashamed to have out on display. The royal green walls and clean silver accents sit beautifully behind natural foliage and contrast well with the stark white bodies of our traditional marquees. Inside, they feature individual cubicles to give each guest their own privacy. Large mirrors with vanity shelving sits alongside sinks with hot and cold flowing water. So, whether your guests need to freshen up with a new coat of lipstick or simply pop in and out, they’ll do so in comfort and style. Our portable toilets are consistently maintained to keep them looking sharp and ensuring that they’ll sit perfectly at your corporate event through to your magical wedding day. 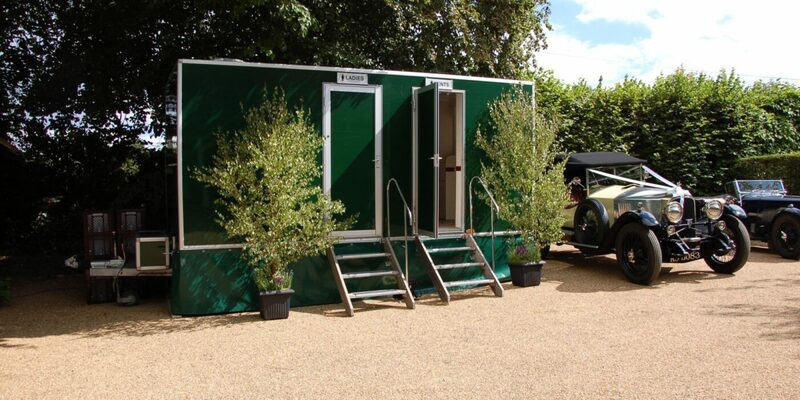 To minimise disruption to your event, our luxury toilets are self-contained. This means that all waste is contained within secure bins built into the design. They are large enough to comfortably hold the waste produced during a single day event. For longer events (2 days or more), our waste disposal team will arrive to empty the waste at pre-agreed intervals. This is swiftly removed and taken to an authorized sanitation cleaning facility where it will be treated safely and sanitarily. This entire process will be done during the quietest part of the day to ensure minimal disruption and allowing your event to flow smoothly. How are portable toilets powered? Here at Carron Marquees, our luxury loos can be powered by either a mains electrical supply or an authorised generator. During the planning process, we will discuss the different electrical requirements and establish which option is required for your event. To make the process as seamless as possible, we also offer Quiet Generators For Hire that are available in a range of different strengths. So, whether you’re catering for 1,000 or 100, we’ll ensure your guests are comfortable at all times. Do they have internal lights and a flushing system? 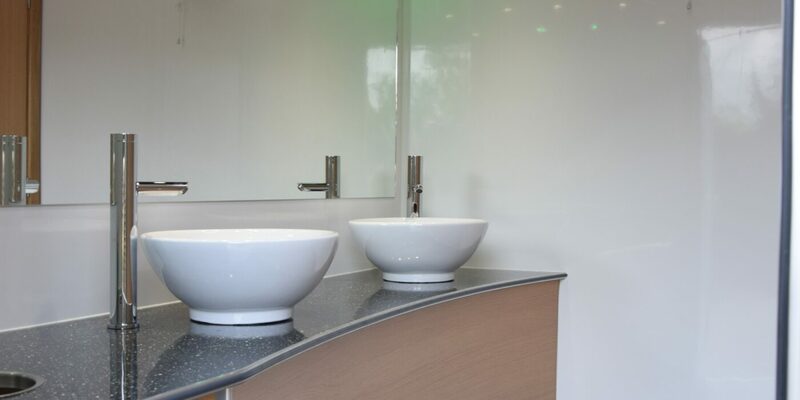 Our luxury loos are designed to make the experience feel as homely as possible. For this reason, we ensure Our Portable Toilets are fitted with basic amenities to smooth out the entire process. Lights will illuminate the toilet space at all times – especially important for the most dedicated of guests who plan to party through the night. The hand-flushing system gives a degree of waste disposal control to the user, allowing them to use the facilities in comfort and dignity. We want each and every guest to leave our luxury toilets feeling as refreshed as they would from their own, at-home loos. Do I need to supply additional water or access to sewage points? Our goal is always to make your event run as smoothly as possible. Each of our self-contained toilets requires nothing more than an electrical connection. This means that there is no need to syphon off additional water or gain access to local sewage points during installation. The in-built bins are fully equipped to store waste safely and hygienically throughout your event. An integrated flushing system is operated by the user and ensures the toilets stay useable at all times. Can the toilets be locked for safety? Yes. 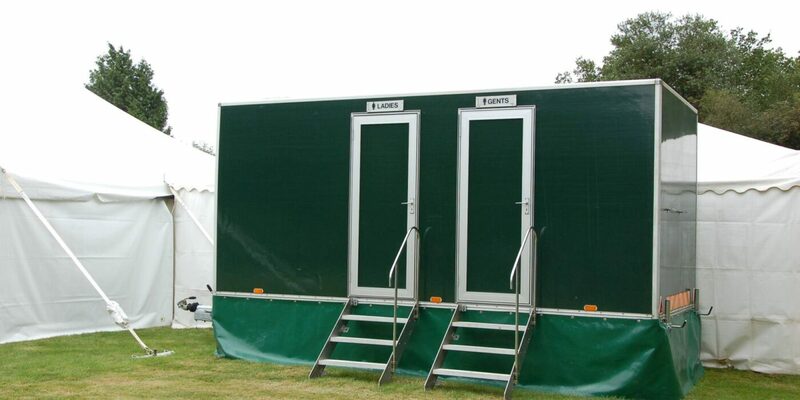 Particularly important on multi-day events, our portable toilets are designed to be locked away securely. This minimises the risk of vandalism overnight and ensures all insurances are abided by throughout the event. The luxury loos are provided to the main contact with a set of keys that can be used at their own discretion. Keeping your toilets locked also minimises the need for excessive maintenance throughout longer events, thereby freeing your time up to attend to more important matters. We understand how vital it is to cater for every single guest at your event. Portable toilets are no exception to this and come in a host of different styles and designed. 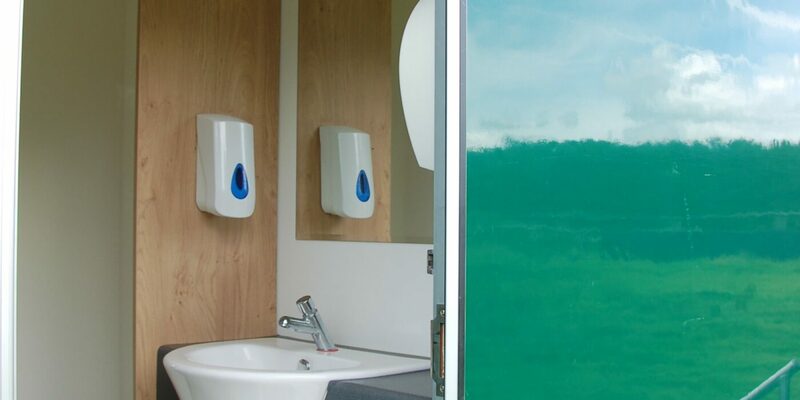 Our disabled portable toilets have all the premium benefits of our standard toilets with larger doors, ramp access and alterations made to the hand washing facilities. Our goal is to ensure that every single toilet option at your event makes the guest feel clean, refreshed and ready to continue on with their celebrations. During the planning stages, we will discuss the different accessibility options with you, including toilet location and site type. During the planning process, we can discuss each of these options with you. We understand that there are individual requirements for specific items and will do our best to accommodate for them. For family events, sensitive soaps ensure that everyone can use the environment comfortable. Our team will always work hard to create the event of your dreams, right down to the basic facilities that come supplied with our portable luxury toilets. Where can a portable toilet be placed? Portable toilets give you a greater degree of flexibility when it comes to designing the layout of your event. However, for the safety of your guests, there are a number of considerations you should take into account. Ground surface – Portable toilets need to be placed on flat, firm ground to ensure they can be used appropriately. Accessibility – Guests should be able to access the toilets easily from your event location. These considerations need to take into account your disabled and less-able guests as well. Delivery Route – We will need a clear and unobstructed route to deliver the toilet to its location. Remember too that, when we collect the toilet at the end of the night, it will be heavier. Experience has shown us that damp grass provides ample friction to transport heavier items, however, we will work with you to find the ideal access route. During the planning process, it works to consider where guests may commonly find themselves needing the toilet. 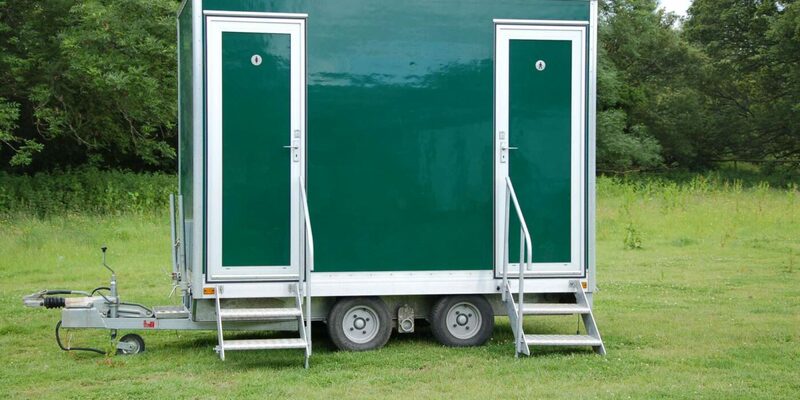 Consider placing portable loos as close as possible to your marquee. The exit door or access near a cloakroom is also a popular location, allowing guests to make themselves comfortable for the journey home. Another factor to take into consideration is where your food station or bar will be situated. Although a portable toilet is self-contained, guest’s are likely to be unimpressed if they are placed directly next to the main eating area. As mentioned above, try to focus on communal areas away from dining locations but within close enough vicinity that they’ll be able to nip out mid-meal, if required. Can portable toilets be placed inside? For the most seamless and uninterrupted set-up, many portable toilets can be integrated with your marquee design. This is particularly vital for Winter events, allowing guests to stay hidden from the elements at all times. As with all other features in your layout, we will work with you to create an event setup that works seamlessly for all guests and staff members involved. What do I do in the event of an issue during my event? Portable toilets are generally quite durable devices. They are designed to withstand different weather conditions, have in-built flushing and waste systems. In most cases, they will operate independently from your event. As events port-a-loos are kept separate from construction types, they are maintained to a higher standard and serviced regularly. This minimises the risk of damage and therefore, incidents during your event. However, as with anything, situations can arise which put you and your guest in an uncomfortable situation. Here at Carron Marquees, our luxury loos come under the remit of our 24-hour call out service. Along with the other facilities at your event, we will ensure that someone is there to either guide your workers through the repair process or to be on hand in the shortest period of time. Contact us directly should this be of concern. What insurance is needed to cover portable toilets? With most hire companies, including Carron Marquees, our equipment comes fully covered by our own public liability insurance policies. However, there are a range of additional insurances specifically tailored to covering portable toilets. It is worth discussing your specific needs with the hiring company to avoid doubling up on insurances and further expanding out of your specified budget. Contact us today for our initial, no-obligation consultation. Our experienced team will work with your requirements and help to recommend the best marquee, dressings and portable toilets to suit your needs. We take your guests comfort and enjoyment seriously, with every member of our team dedicated to meeting your final requirements. Let us help you discover your vision and ensure every second of your event goes like clockwork.